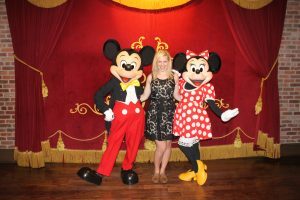 With so many amazing characters to meet across Walt Disney World, Disneyland and Disney Cruise Line, here are some tips to make the most of your Disney Character interactions! As a former Character Attendant at Magic Kingdom, it was my job to facilitate meet and greets with some of the most beloved Disney stars – from Mickey and Minnie, to Ariel and Eric, to Buzz Lightyear – there were lots of friends to see! And while I was able to see thousands of faces light up with pure joy, I also saw some not-so-great interactions. Keep on reading to learn how to have a great time meeting your favourite characters! First and foremost, if there is a character that you want to see – whether it’s for an autograph, a hug, or a photo – get in the line. And if the line is closed, ask when to come back. If the Character Attendant, or Blueberry as Tinkerbell calls them, says that Snow White will be back at 3:40pm, then make sure to come back earlier than that! The characters can only see so many Guests at a time before they have to go to the parades, or help Abu get out of trouble, or get a small smackeral of honey. So if you feel that getting that photo will make or break your vacation, make sure to get in line to avoid disappointment. Make sure you have your camera turned on, your autograph book open to the page you want them to sign, and have your pen or marker uncapped to hand directly to the character. If you have a little Mousketeer, and they are feeling a wee bit nervous, just let the character know and they will try to make a magical moment, even if it is from afar. And remember, you can always ask a Cast Member to take a photo for you. While on the topic of autographic books, if you don’t want to pay for an autograph book, or are thinking that it may end up sitting in a dusty box in the basement, then think of something that is maybe more practical. Consider the mat of a photo frame, a scrapbook, or a blanket. If you want to have a shirt or an article of clothing signed, please note the characters cannot sign anything that you are wearing. If you are hoping to have a piece of fabric signed, I would suggest having a clipboard or sturdy piece of cardboard to make it easier to sign. Don’t Force It and Have Fun! 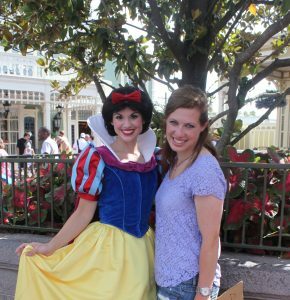 Meeting a favourite character can be so exciting, but it can also be a stressful situation. If you have someone in your party who really does not want to meet a character, don’t make them. The resulting crying, bad mood, or temper tantrum will not make for a better trip. Your Disney vacation should be a magical time, and waving to Cinderella in the parade is better than nothing! For more questions, tips, and advice, be sure to contact a Fairytale Dreams & Destinations Inc.™ Vacation Specialist today!